Follow these steps for learning grammar! Were you taught grammar in elementary school, middle school, or high school? (I wasn't.) If not, what have you done to remedy that? (Make sure you're getting our free email lessons.) Today, I want to share part of an email that I received from a reader named Joe. I am a 54-year-old financial planner, and I have college degrees in accounting and history. I was taught almost no grammar in high school or college. When my mother complained that we were not being taught grammar in our high school English classes, she was told that we should have already been taught grammar by then. Several months ago, I asked my wife how to use "affect" and "effect." She told me "affect" was a verb, and "effect" was a noun. That answer did not help me one bit. Does Joe's story sound familiar to you? If I were sitting next to you right now, could you tell me the difference between a verb and a noun? Joe went on to say that he has become an avid grammar student and he is using sentence diagramming to help his understanding. He noticed a gap in his knowledge and took responsibility for it. He took action and began learning on his own. I find that inspiring! 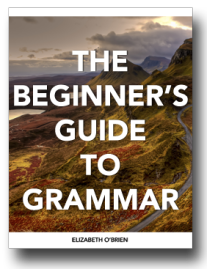 If you can relate to Joe's story and you'd like to learn grammar, I'll show you five steps you can take right now to get a better understanding of grammar. If you're confused about grammar, what are you waiting for? It's your time to learn! If you're insecure about grammar or writing, I urge you to spend some time learning. You're smart. You can do it! Every single word can be categorized into one of eight word groups, or parts of speech. If Joe had known the parts of speech, he could have benefited from his wife's answer. Understanding the parts of speech is the first step towards learning grammar. 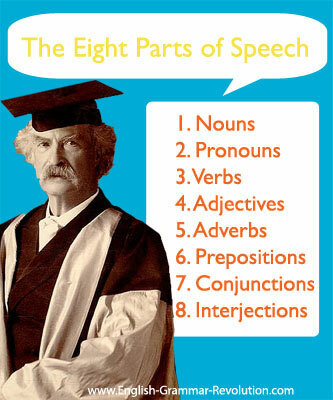 Learn about each part of speech with the lessons and links on the parts of speech page. It's great to understand all of the word categories, but the magic happens when we start to put words together. That's why the second step for learning grammar is to learn more about sentences! Yes, you use sentences all day long, but do you really understand what they are? Read over what it takes to make a sentence. Now things are going to start getting fun! Phrases are units of language, and we use them all of the time. They are groups of words, but they come together to function as a single unit. There are many different kinds of phrases. This picture shows you a sentence diagram that contains a verb phrase. The words in blue are all individual words, but they are coming together to perform the job of one part of speech. They are functioning as the verb, so we call this a verb phrase. Go to the phrases page and familiarize yourself with phrases. If you're a beginner, focus only on verb phrases and prepositional phrases for now. Clauses are another unit of language, and learning grammar requires that you study them next! All clauses contain a subject and a verb. Some clauses can stand alone (independent clauses) and some cannot (dependent clauses). Those that can't stand alone function as single parts of speech - just like phrases! 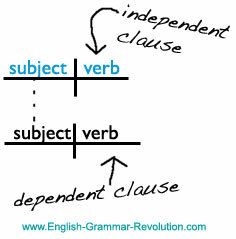 Go to the clauses page and study independent clauses and the three types of dependent clauses. Sentence diagramming is a great way to help you learn grammar and retain everything that you learn for years to come. 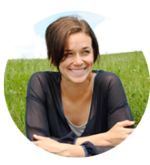 Sprinkle your diagramming lessons throughout the first four steps. 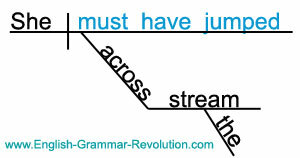 You'll start with sentence diagrams like this. 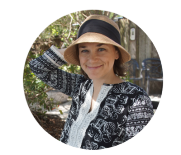 Learn some basic diagramming starting with these sentence diagramming exercises. And you'll gradually be making sentence diagrams like this. You can learn grammar and sentence diagramming by going through the information on this website. Use the steps and links above, and you'll be on your way! If you want a more interactive approach for learning grammar, check out our Get Smart Grammar Program. It goes through all of the topics listed above (and more) and gives you videos, exercises, and quizzes to test yourself along the way. The lessons are broken down into manageable chunks, and all you need to do is go through the lessons in order. If you'd like to learn more about learning with these easy video lessons, go to the Get Smart Grammar Program page. You are the biggest lifesaver. I was really struggling with diagramming prepositional phrases, and because of that I failed quizzes. Now I totally understand it. THANK YOU SO MUCH! I hope that these steps help you. Thank you for being here!